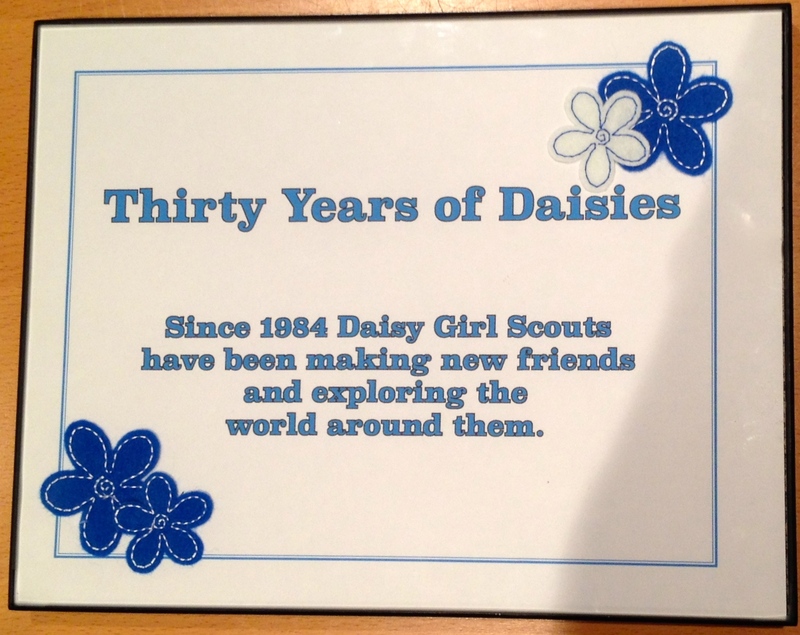 As 2014 draws to an end, we celebrate the 30th birthday of the Daisy Girl Scout program. In October 1984, kindergarteners joined their older sisters as the newest Girl Scouts. The new Girl Scout Leadership Experience, implemented in 2008, regrouped age levels and made Daisies a two-year program, for kindergarteners and first graders. Councils piloting the kindergarten-age program used this guide, published in 1975. 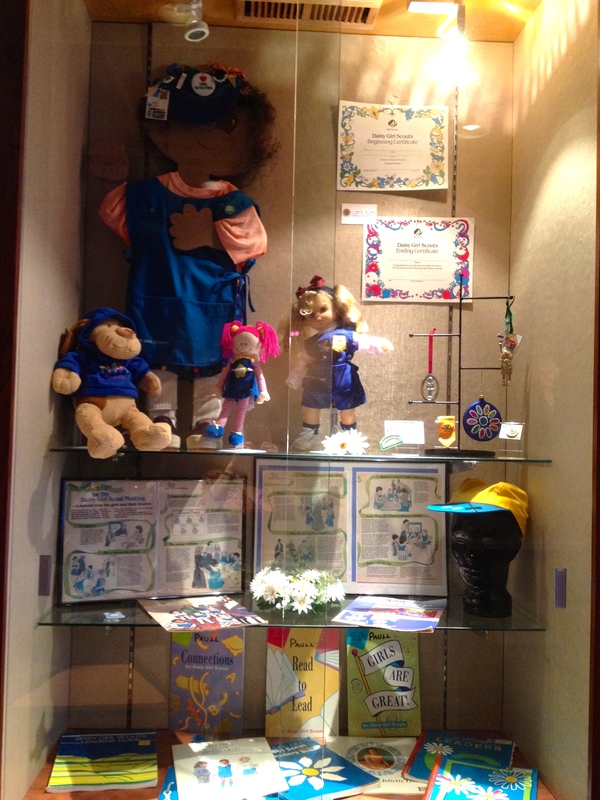 The Daisy program has grown considerably over the years. The first Daisies received a scrapbook to record her experiences and activities. She carried her scrapbook in a clear plastic pouch and saved room in the scrapbook for certificates marking the beginning and end of her Daisy year. 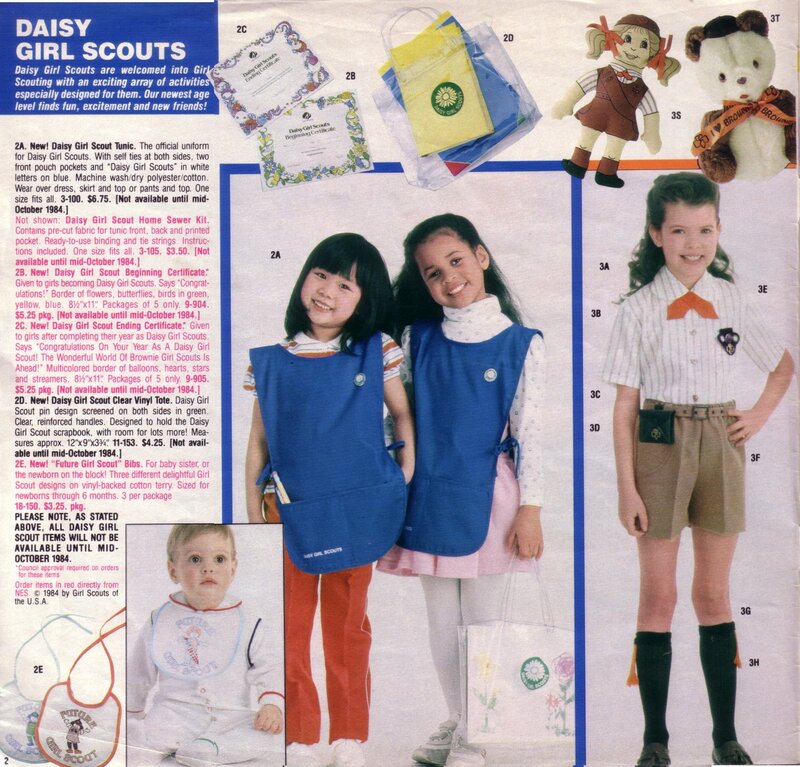 Daisy pouch and certificates (1984 catalog). 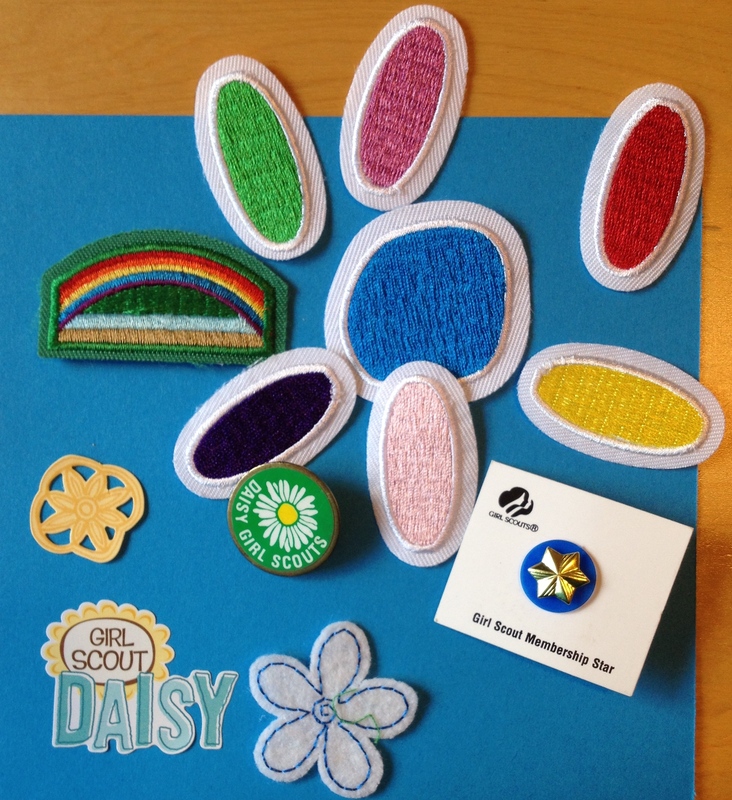 Daisies always had their own membership pin, but they did not earn recognitions for nearly a decade. The Bridge to Brownie patch was introduced in 1993, petals in 2000, and leaves in 2011. Daisy insignia over the years. The Daisy uniform has evolved from a simple blue tunic to range of options including shirts, shorts, leggings, hats, and a vest plus a closet-ful of unofficial fun wear. Drop by the GSCNC Main Office at 4301 Connecticut Ave. NW and check out the delightful world of Daisies! This display was inspired by a question in the “Ask It Basket” at the August Kick-off. Do you have an idea for a display? Let me know! 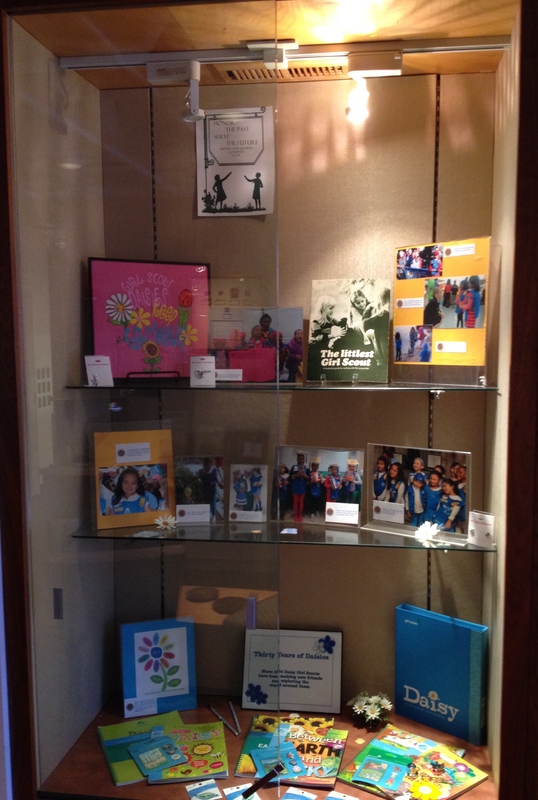 This entry was posted in Exhibits, Juliette Gordon Low, Program and tagged Daisies, Daisy Girl Scout, Daisy Girl Scouts, Girl Scout Council of the Nation's Capital, Girl Scout history, Girl Scout memorabilia, Girl Scouting, Girl Scouts, GSCNC, GSUSA, Juliette Gordon Low. Bookmark the permalink.